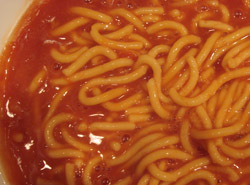 I love Heinz spaghetti…you don’t have that in the US? I’m surprised. yes we love this mushy not very tomatoey spaghetti. 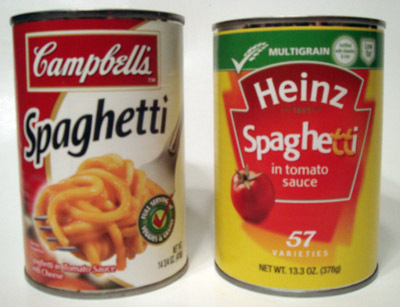 Campbell’s aka Franco American sauce is highly adulterated with carrots. That’s why I still likes me some Chef every now and then, but won’t touch Spaghetti-O’s. Oh ick. Can I vote “neither one unless you want me to vomit”? I can’t eat any canned pasta product. Franco rules! 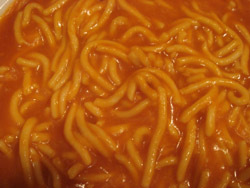 If eaten cold the pasta is not mushy. I grew up with Franco American, but I don’t really like it. I do, however, like the Heinz version if I get it boiling hot and add loads of fresh cracked black pepper. It’s soooo yummy that way!